The Testing or as I have come to call it The Hunger Games 2.0 was one of my more anticipated releases of 2013. The premise of The Testing sounded solid enough and based on the nearly glowing reviews pouring in I had high hopes it would surpass expectations. However, that amazing read I was waiting for wasn't to be. It's not that The Testing was bad it's just I felt like I had already read it before. In fact, it took me 3 weeks to power through The Testing and I can't even begin to tell you how many times I picked up the book swearing to myself I wouldn't read another page. Yet...... despite the plot being unoriginal, the characters seeming dull and lifeless and the romantic elements giving me a permanent case of eye rollitis I managed to stick with and finish the book. Here's the thing, I actually loved the beginning of The Testing. Until Cia is called upon to take The Testing I really felt myself being drawn into the world. Her family had a very Weasleyesque vibe going on that I really dug. It was only after Cia and her group leave for the city that I started becoming disenchanted with the book and the characters. First off let's talk about Cia. At first her enthusiasm for advancing her studies was admirable and I could see why she wanted the opportunity. However, once she learns the truth behind The Testing she quickly goes from doe eye teenager to insufferable idiot. What's even worse is she's told not once but several times over not to trust anyone so what does she do? Quickly spills every secret to her competition. It's beyond frustrating and just made her so unlikeable. Secondly, the romance was just so forced. I don't understand what the boys saw in Cia except she was someone to manipulate. Oh but they are cute, you say. So what, so are puppies doesn't mean everyone should own one. Must unlikable love triangle this year goes to The Testing that's for sure. However those aren't even my biggest pet peeves with The Testing. No, that goes to the extreme lack of character and world building. Everything was just so generic. The world was so fluffy for lack of a better term. We saw just enough to know where the characters were but beyond that were left in the dark. It's like the Author was afraid to put any depth into the story. I barely learned anything about the other candidates and what I did learn felt extremely superficial. 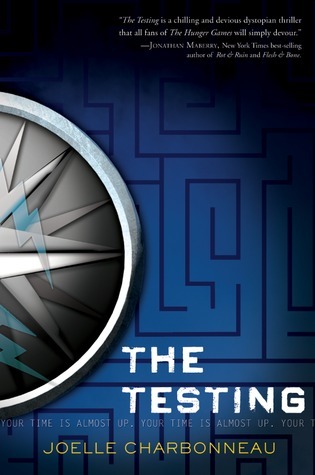 I suppose this again brings us back to why I feel The Testing was a Hunger Games rip off. The Testing was just different enough not to break copyright laws but close enough where the story can ride on the coat tails of it success. Overall, I was really disappointed with The Testing. It really didn't need to take the direction it did to be successful. I would've been perfectly happy if The Testing candidates never knew until the end whether they passed or failed. It would've been a great surprise to wait until Graduation day to show which candidates succeeded or not. No maiming each other, no morally corrupt testing officials, no Hunger Games style competition just a series of tests that get progressively more tricky to complete. Keeping the candidates in the dark about their success could've brought the tension, no gimmicks (memory wiping anyone) required. Do I suggest you read The Testing? No, but if you do I'd highly suggest borrowing first not buying. I'm still on the fence whether I will continue this series or not. However, If I do I will definitely force myself to DNF instead of sitting through a book I don't enjoy fully. With that being said, I will be giving The Testing by Joelle Charbonneau ★★★. I really wish I had liked it more but I just couldn't shake the other books shadow clearly hanging over it. It's always a relief realizing your not the only ones to feel a particular way about a book isn't it? I wish some would at the very least take the first in the series to plant the seeds of romance without actually having characters come together right away. "Eye Rollitis"! HAHA That's so funny! I got this one as well but have yet to start it. From what I have seen-- it isn't getting a lot of love. I dislike forced romance almost as much as insta love. Sorry you didn't enjoy as much as you hoped! Great review! I loved this book. I think that if you like dystopia then definitely give it a try. I've read tons of positive reviews for this one. And would definitely recommend it. Looking forward to book two which came out this week.